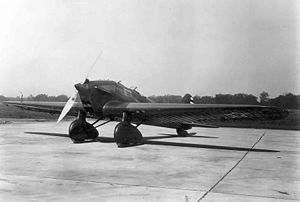 The General Aviation / Fokker XA-7 was a prototype attack aircraft ordered in December 1929, and first flown in January 1931 by Fokker and then General Aviation Corporation after it bought Fokker-America in 1930, and entered in a competition held by the United States Army. However, the Curtiss A-8 won the competition, and A-7 development was not continued. The XA-7 was a two-seat low-wing all-metal monoplane design. It featured a thick cantilever wing, tunnel radiator and two closely spaced open cockpits. Despite some innovative features, the XA-7 did not proceed past flight test status. After testing, the sole prototype was scrapped. Wagner, Ray. American Combat Planes of the 20th Century, Third Enlarged Edition. New York: Doubleday, 1982. ISBN 978-0930083175.